Home » Our Doctors » Sophia B. La, O.D. 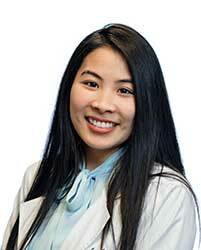 A North Texas native, Dr. Sophia La was born and raised in Arlington, Texas and is the oldest child in her family. She graduated in the top 10 percentile of her high school class and was a recipient of the International Baccalaureate diploma. Dr. La then moved on to complete her undergraduate studies at UT-Arlington, where she graduated with a Bachelor of Science degree in Biology in 2013. Her studies then took her to the InterAmerican University of Puerto Rico – School of Optometry, where she had the opportunity to service underserved communities and gained valuable experience in treating various ocular diseases including diabetes, glaucoma, infections, and cataracts. Dr. La was also an active member of theAmerican Optometric Student Association and American Academy of Optometry (AAO) during her graduate studies, and in 2016 was a recipient of the J. Pat Cummings Scholarship, awarded by the AAO. Dr. La then graduated as valedictorian of her class and was awarded a Doctor of Optometry degree in June of 2018. Dr. La now joins the team of doctors at TSO Mansfield. Dr. La is a licensed Therapeutic Optometrist and Optometric Glaucoma Specialist. Her passion lies in managing ocular conditions such as diabetic retinopathy and glaucoma, and in providing personalized comprehensive eye care for every patient. Dr. La enjoys enjoys working with both children and adults, and is proficient in providing comprehensive eye exams in both Spanish and Vietnamese.Outside of the office, Dr. La enjoys spending time with her family and friends, playing tennis and badminton, video games and movies, and arts and crafts.